My flash setup has gone through a continuous evolution. Below you can see various configurations starting with my Mk I Setup. I am now up to Mk IV, which I will describe first. Left foreground: Netbook which controls the camera remotely using Breeze DSLR Remote software. Behind that can be seen a Vivitar 283 flash on a purpose-built mounting with the termination of one leg of fibre optic in front of the flash. This is the silvery cable seen leading from the front of the flash. Underneath the flash is a stack of boxes. These are, at the bottom a resistive control box to control flash duration. The method for setting this up can be found on Charles Krebs' Krebsmicro website (The other articles accessible from the Krebsmicro home page provide much valuable information). Next up is the control box for the continuous illumination and in front of these boxes, a Luxeon K2 LED continuous light source with fibre optic plugged in. See below for details. Finally there is the Zeiss Standard microscope with the camera mounted. The Canon EOS 500D drives my flash system via hotshoe. It fires a Vivitar 283 via a Wein Safesync. The use of a Safesync is advisable because older flashes such as the Vivitar 283 may present high voltages to the camera hotshoe. Modern digital cameras are not designed to work with high voltages and damage may result. The Safesync effectively isolates the camera from any unwanted high voltages. Shutter release can either be by mouse or by foot pedal emulating a mouse click. This gives both hands free for adjusting the microscope. Very useful when chasing high speed animalcules. 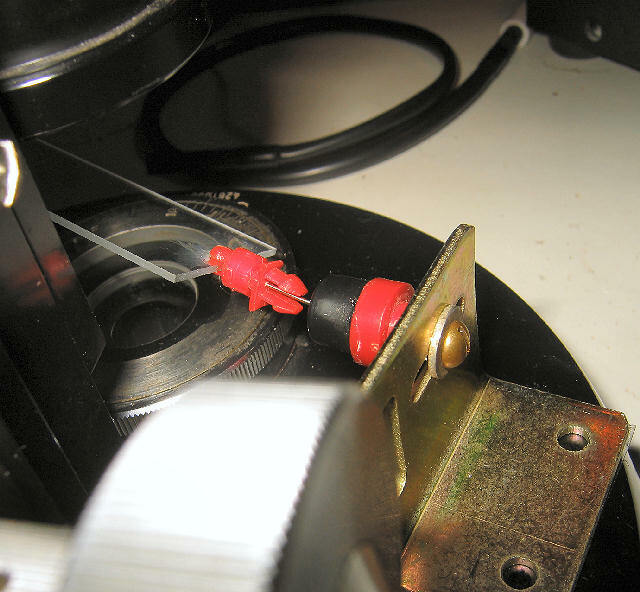 Details of how the camera is attached to the microscope can be found on my Adapting Cameras to Microscopes page. Each of my Standard and Standard GFL microscopes accept the end of the "Y"- fibre optic and some of my other instruments have been or will be modified to accept this fibre optic. See for example the Diavert page. The fibre optic is simply clamped in front of the flash. 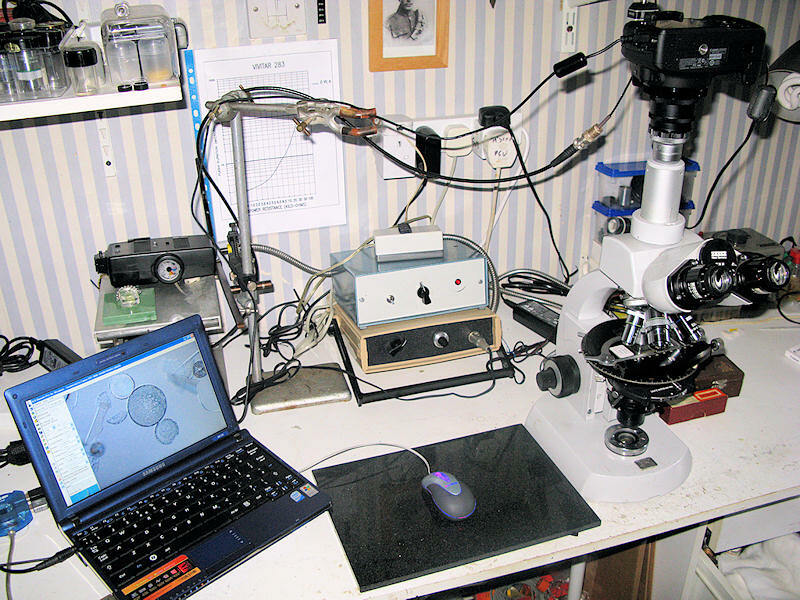 This is how I first set up my microscopes for flash. An 18" fibre optic cable is used to route the flash from the camera into a lamp modified by removal of the lamp bulb. 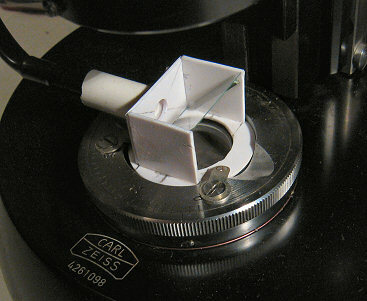 A microscope slide is used as a mirror, thus allowing normal use of the microscope's own light source. The lamp and mirror are set up by coupling the fibre optic cable to a white LED and adjusted in the normal manner for a lamp and mirror. Once alignment is complete, the cable may then be attached to the camera nest which has a port to take the cable such that it is positioned just in front of the camera flash. This setup can also be used for the Olympus FH. I obtained the fibre optic light guide from C and H Sales Company (OL9508 OPTICS 18” FIBER OPTIC LIGHT GUIDE). These light guides have a multitude of other uses. This is the alternative, Mark II setup. 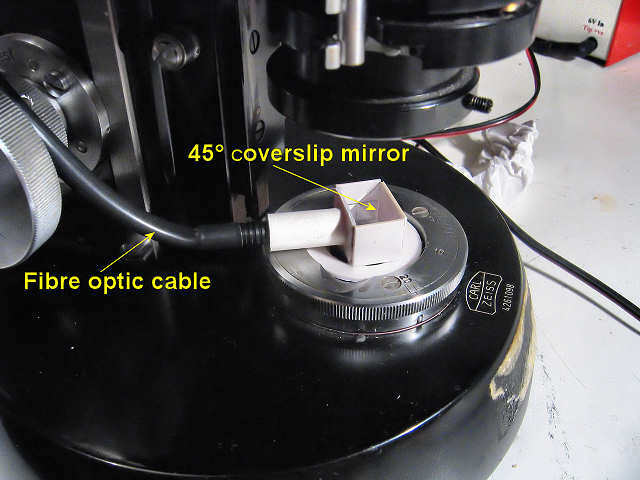 It uses the same type of fibre optic cable as in the Mk I setup coupled to a mirror made from a coverslip set at 45° and placed directly on the optical axis of the microscope. The tip of the fibre optic cable is optically in approximately the same position as the substage field diaphragm. The far end plugs into a push-fit tube mounted opposite the camera flash on the camera holder. This setup gives less light loss than the Mark I setup and makes for a less cluttered bench. The mirror cannot be displaced accidentally and the whole setup is more robust. The mirror holder assembly is constructed from polystyrene sheet and mounted on a polystyrene ring with an aperture the same size as the fully open substage aperture. It was originally held in place by double sided adhesive tape, but a better method proved to be to use metal clips retained by the screws on the surround of the substage light aperture. The clips are made from old solder-tags. With this arrangement, the mirror can be easily centred and then clamped in place. The coverslip mirror is not glued in place, but rests on two rails and hence can easily be removed for cleaning. Alignment of the assembly is by plugging the far end of the fibre optic cable into a tube containing an LED. The mirror can then be placed such that the light is central to the field as observed through the eyepiece. 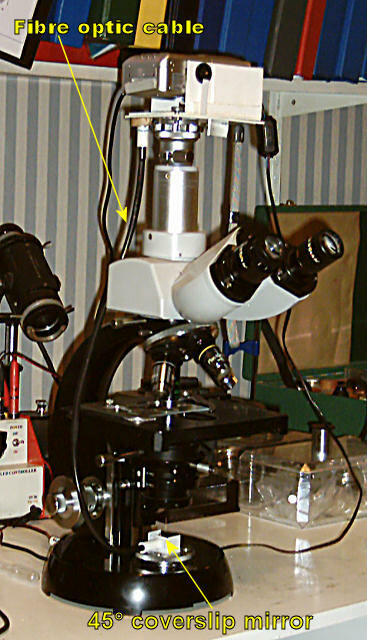 The same setup can be used on my Olympus FH microscope - see below. Mk IIa Setup with centrable mirror assembly and removable mirror. This is the Mark III setup. The microscope is the Zeiss Standard GFL with Leitz ICT substage. Illumination is via a fibre optic "Y" cable, one leg of which takes a 100 W light source, the other leg collects the flash from the camera (Canon Powershot S50, not shown). 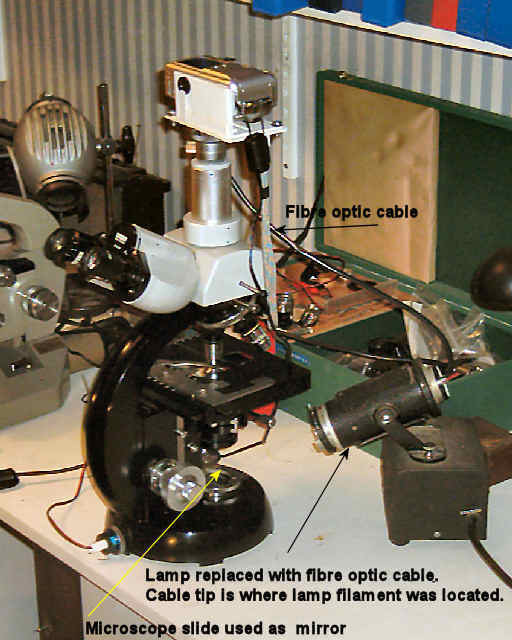 The fibre optic feeds directly into the lamp housing at the back of the microscope. I use Breeze Systems PSREmote software for remote shooting with a mouse foot switch for release. This software has a very useful preview feature, but because image transfer and control of the camera from a laptop increases time between shots, for rapid shooting I used a pneumatic release with a home made foot pedal improvised from a 50 ml syringe (the original bulb soon split). PSRemote gives live preview, but I also used a small LCD video monitor. The laptop is part of my home wireless network.